The study reports that the distinct radiocarbon isotopic composition of Macondo oil provided a sensitive tracer to estimate petro-carbon contributions from the Deepwater Horizon spill to the planktonic food web. 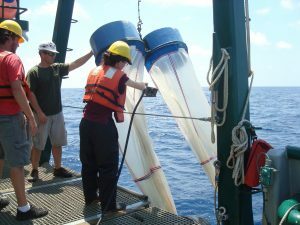 Researchers measured carbon values in plankton collected from areas about 100 km north of the spill site and analyzed surface waters from coastal and offshore sites for dissolved inorganic carbon. Scientists used the Woods Hole National Ocean Sciences Accelerator Mass Spectrometer and the Florida State National High Magnetic Field Laboratory to analyze samples. Their results supported the hypothesis that carbon from the Deepwater Horizon spill contributed to the offshore planktonic food web and also inferred that methane input may be important. Additionally, their results support the findings of an earlier study by Graham et al (2010 Environmental Research Letters 5 045301).